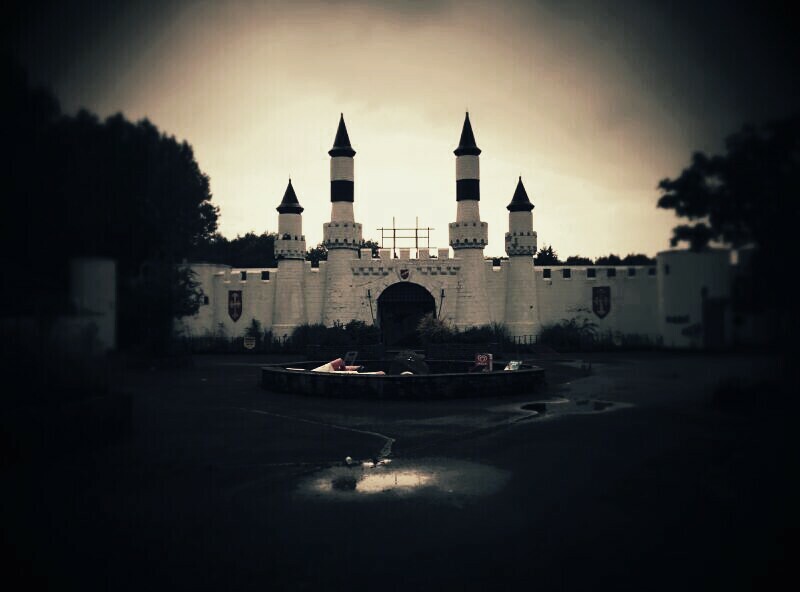 For my first visit I chose to go to Camelot, as it was this site that inspired me to take up the hobby. All my life I have adored theme parks and roller coasters, and I couldn't pass up an opportunity to go to one where I could have the run of the place, and to explore without the hoards of people getting in my way. 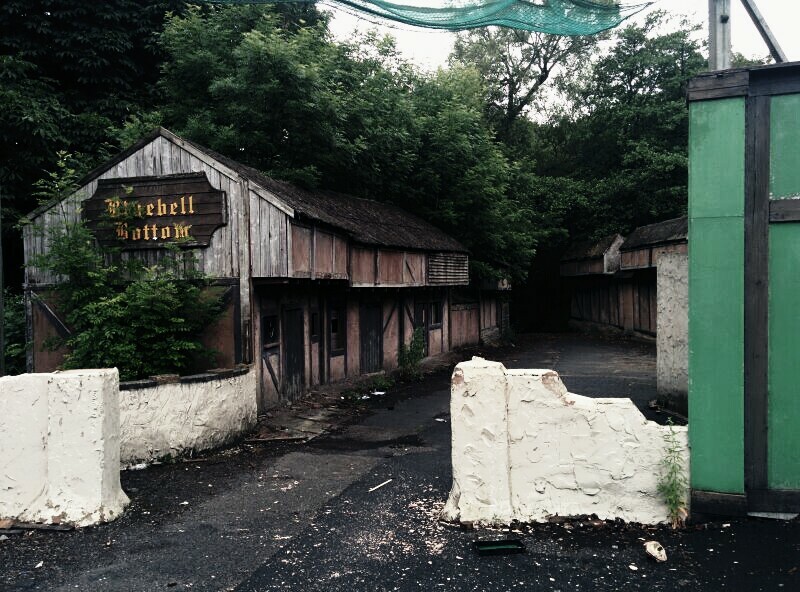 The Camelot Theme Park is located in Chorley, Lancashire, it opened in 1983, and closed after the 2012 season. The theme park was based on the legend of Camelot, Arthur, and the Knights of the Round Table, with locations and attractions around the park being named in keeping with the overall theme. 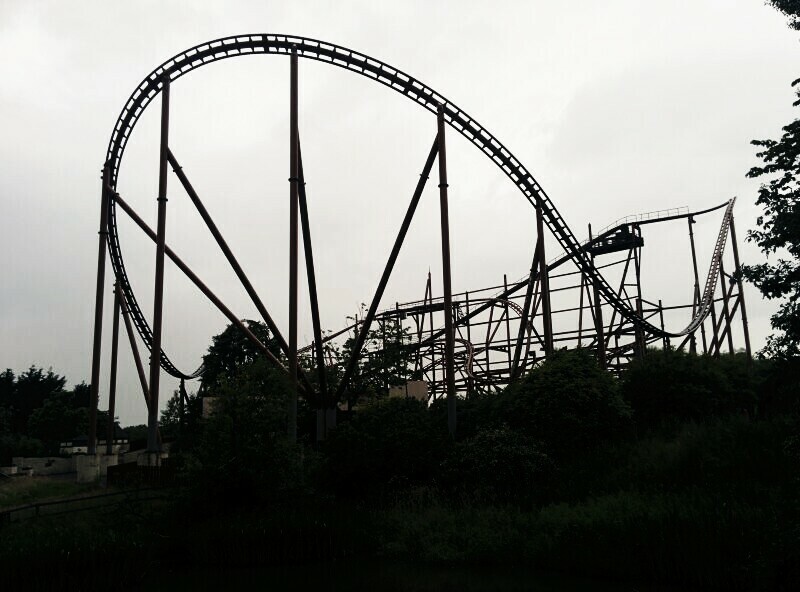 Althought the park was aimed at families, it did have some thrill rides, including the main roller coaster Knightmare which is the last remaining ride left at the park. 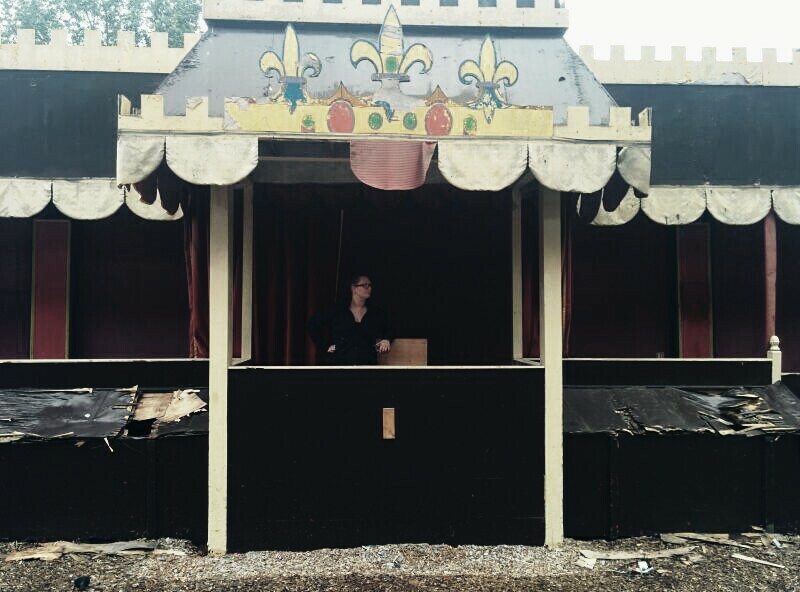 In addition to rides the park also put on jousting, birds of prey and magic shows. Over time the park started to lose its attraction, with attendance falling from 500,000 in 1995 to 336,204 in 2005. It also suffered controversy with accidents being well publicised. In October 2001 a park employee was struck by the Gauntlet roller coaster and killed, with the park being fined Â£40,000 for having no written safety procedures for its staff, and in August 2011 a 12 year old boy fell from the Excalibur 2 ride, although he survived. Next we found the entrance to the Dragon Flyer ride, the tracks remain and we got some decent pictures. 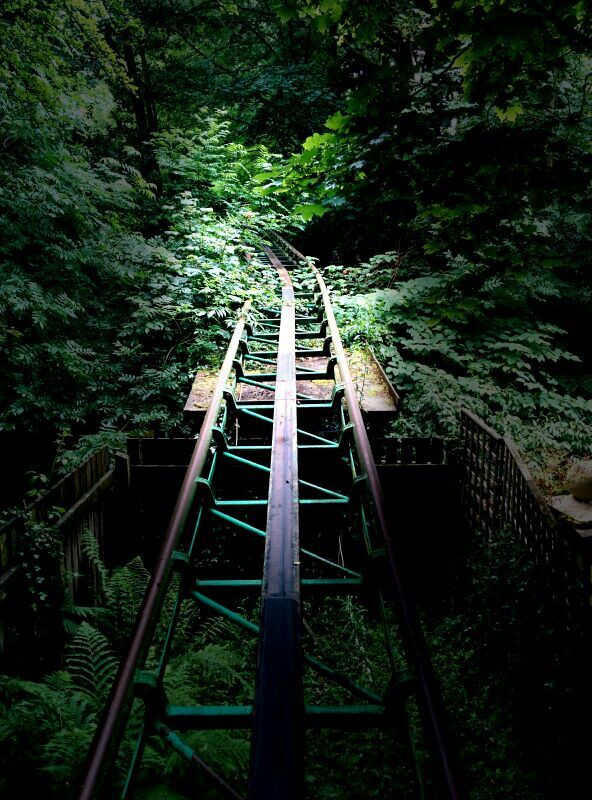 It's quite sad as a lover of roller coasters to see the tracks disappear into the overgrowth of the woods, but its also quite beautiful as well. Next we headed up towards the entrance and got some great photos of the castle before exploring the outer buildings. The park itself is not what I would consider derelict, but it shows obvious signs of damage from people who have gained access yet have no desire to preserve the site. Strewn with litter and signs of looting and vandalism, no glass window has been left unsmashed, and no area remains as it was. As we headed back down to explore the other side of the park we encountered 6 chavs, one with a pick axe over his shoulder, heading towards us. Needless to say as I first spotted them I almost peed myself thinking we had been caught, but they just laughed and passed us by. It pains me to think of why they were here, while we creep around trying not to make a sound or cause a disturbance, these chavs, in contrast, walked around brazenly with no care for anyone but themselves. In hindsight I did feel a little silly being so cautious when it's obvious random people wander around the site regularly without a care in the world. But this is my first time out and I was very nervous, especially considering we just happened upon a group of men with an axe. We headed back down to make our way to the other side of the park. I knew it was here that the guard's hut was located, so we increased our creeping and tried to keep noise to a minimum. 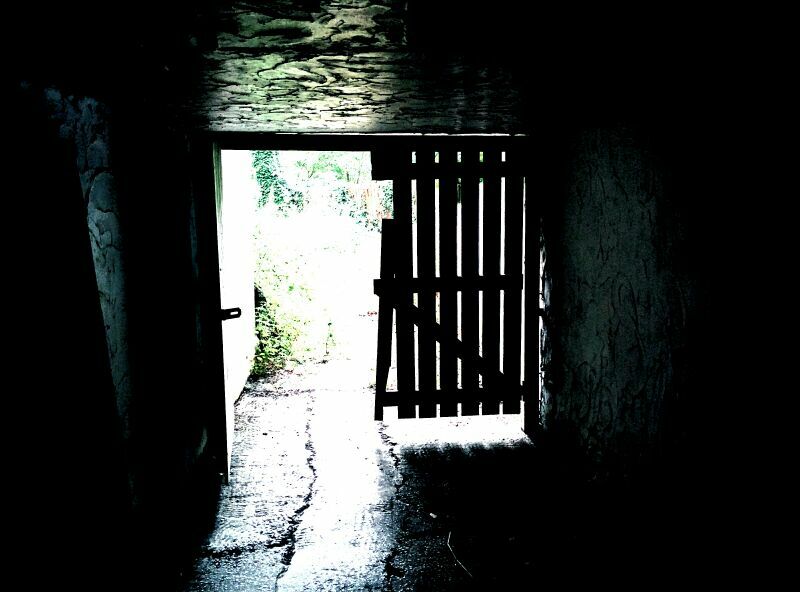 We found a way into the old Dungeons of Doom, and it's surprising how creepy this place was, even though almost everything had gone, and it was daylight outside, I still held my breath as I turned each corner, wondering what I might see. 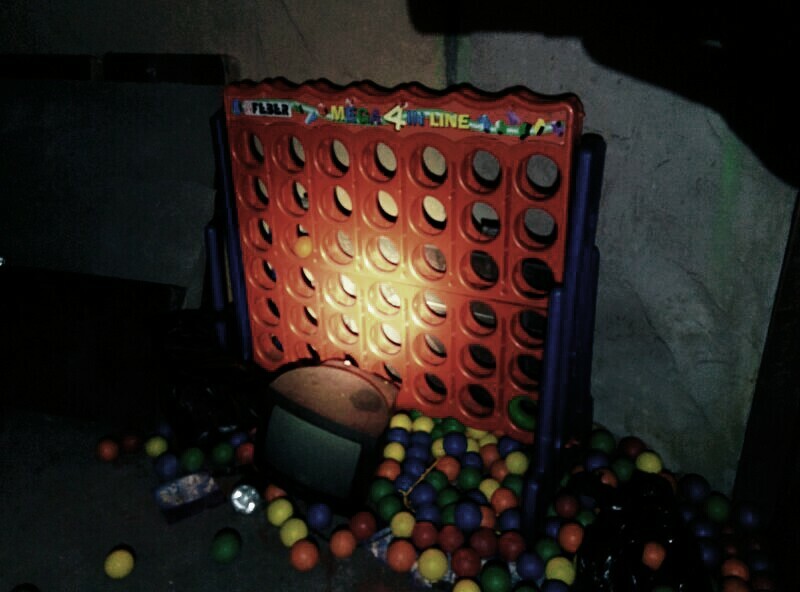 To be honest it was here we came across our most perilous challenge, A corridor lined with ball pool plastic balls had me worried that I would step on one and break my neck, but thankfully we brought the torch and decided to head out. I did have one last momentary panic when I wasn't sure I would remember how we got in, but we found the exit with no problem in the end. heading towards the last standing big roller coaster Knightmare we were most cautious of the being spotted by the guard. We sneaked around back for some good photos, and I was about to try and sneak around the top end for a few more but we heard a bang and some quite obvious movement, so we decided against it and headed back towards our exit. We got out no problems and spent a little over an hour on site, although it felt like longer, I think my heart was racing with a mixture of excitement, and fear of getting caught. In hindsight we probably could have spent longer and checked out some more areas, but as a first ever exploration I don't think we did too bad! Yeah I think I'd take the Owlman over druggies too! Some great shots there! I keep going back to it. Possibly more fun now than when it was open. Looking good - do fancy this.